New light! And, a couple of test rides. As I have alluded to previously, I got a new light for riding. Actually, my wife ordered it for me after realizing that I’ve been gimping along with subpar lights. I’m a lucky guy, having a great wife AND a very bright light! This new light blows everything I’ve ever tried out of the water. The new light is a Magicshine 900, rated at an incredible 900 lumens! GeoManGear has temporarily discontinued sales of Magicshine lightsets due to our concerns regarding the quality of Magicshine’s lithium-ion battery packs. We are working with the manufacturer to quickly resolve these issues and will begin selling Magicshine products again after we have obtained a high-quality battery pack for our customers. If you wish to be notified when we have new Magicshine or comparable lightsets available, please click here to place your name on our waiting list. I have sent them an e-mail asking for more information. And I really hope that my batteries are not affected, or that there is a solution, because this light is amazing, and promises to expand my night riding capabilities. Interestingly enough, I have read quite a few reviews of this light, and most of them have been very positive, not mentioning any battery problem. So I wonder what’s going on. In my living room, I did a couple of unscientific tests comparing this light to the two other brightest lights I have, a Planet Bike Blaze 2W, and a Cygolite Hi-Flux 100. On low, the Magicshine is about equal in brightness to the other two lights. On medium, it ‘s about twice as bright. On high, it’s so bright that I had to check to see if the other lights were even on. The beam pattern is also quite useful on this light. It has a bright spot in the center, but it’s not as tight as the Blaze (a good thing — I think the beam on the Blaze is too tight). The Magicshine also projects light out to the sides, and above and below the main beam. In practice, I have found that I can focus the brightest part of the beam about a block away, and have the road directly in front of me illuminated quite well also. It’s incredible. The beam pattern will be immensely useful for mountain biking, though I haven’t tried that yet. So, you can see why I hope there will be a good solution to whatever battery problem there may be. The day the light came, I did a brief test ride through a couple of neighborhoods and parks. I was amazed at how well I could see. I was able to ride a lot faster than I could with my old lights. Plus, it was a beautiful, clear, starry night and I loved riding along under the stars. Last night, I did a longer test of about 16 miles, west of town. 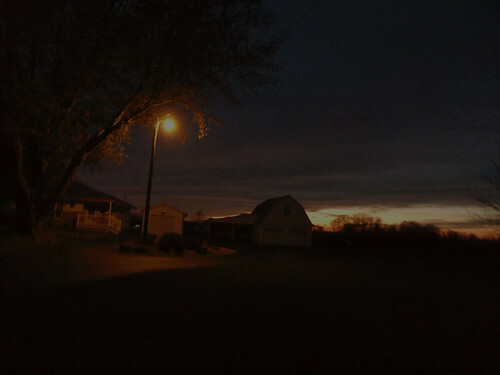 It was dark before I even left the house. I found traffic getting out of town a bit sketchy, but once out in the country the roads were incredibly quiet and beautiful. I saw a cat, a skunk, and some cows … and I think an owl overhead, though it was out of the corner of my eye. 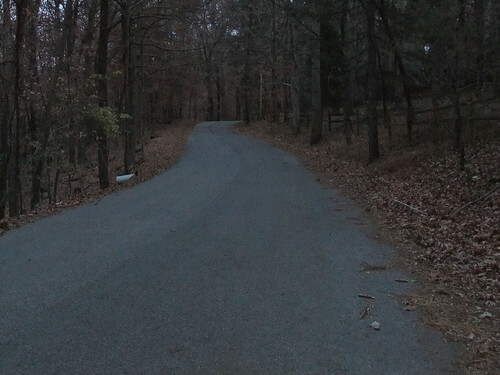 It was a hilly route, and I even hit about 34 mph — in the dark — without ever feeling out of control. Wow. There were some choice moments rolling under the stars, with a crescent moon and Jupiter also visible. 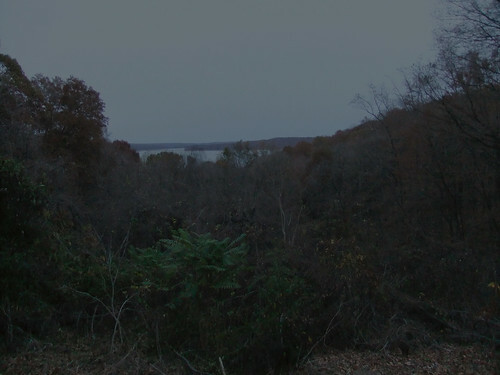 I was a little nervous about this ride with the hills in the dark in a sort of wild area, thinking maybe I should have done something shorter, but I loved being out there; it was over too soon. Traffic was much less of a problem on the way back, so maybe it would help to start my night rides a little later, after traffic has died down more. Right now, I cognitive dissonance is getting to me. My experiences with this light have been amazing so far, but obviously I am concerned about the battery packs. I’ll post updates as I figure out what’s going on. I’m going back to school in January! After high school, I spent 2+ years at Northwestern University, and then dropped out (it’s a long story). I never finished the Computer Science degree I was pursuing, and I have always intended to go back to school. Well, I am finally going to do it! I got into the General Studies program at Indiana University, right here in town. I’m not sure yet what classes I’ll be taking, but I am looking forward to it. It will be strange to be a student again. I hope I am able to adapt reasonably well. A couple of months ago, some ongoing contract work was cut way back. My budget has been severely scaled back ever since. And with school coming up, things are going to get tighter. I’m gearing up for winter. It’s difficult with a small budget, but fortunately I already have most of the things I need. However, this winter will be different from last year. My commute is longer, and I will be riding to/from/all around campus, as well. I have decided to use the Trucker as my main winter bike. I had a pair of studded tires already, but they’re for 26″ wheels, since I used an old mountain bike as my winter commuter previously. So, I knew I would need 700c studded tires. I lucked out and Doug (MnBicycleCommuter) had recently gotten a new set of studded tires, but still had the old ones around, with plenty of life left in them. He offered them to me at a good price. I couldn’t resist. Here is his post about shipping the tires on his Xtracycle. The tires arrived today (already!) and I’m looking forward to trying them out. I’ll need to install them on the Trucker soon to make sure there’s enough clearance under my fenders. This leads me to wheels. I really wish I had an extra wheelset for the Trucker. This would allow me to keep both my slicks and studded tires mounted on a wheelset, and just swap out the wheels. I am not sure yet if this is going to be in the budget. My lighting situation has been less than ideal for a few years. I have a few lights which have been adequate when combined, but again, with a longer commute, I’ll be spending more time riding in the dark. I knew I would need something better. Fortunately, my beautiful wife ordered me a light. It’s not here yet, but I am looking forward to testing it out. It’s going to blow my existing lights out of the water. This light will also be useful for night rides on the road, mountain bike rides, etc. I can’t wait! I’m also investing in some more reflective gear. In addition to a longer commute, I’m hoping to get more riding in this winter than ever before. That will mean a lot of riding at night, and I need to stay visible. I’m not sure yet what else it will hold, but already I can see that 2011 is going to be a very interesting year! 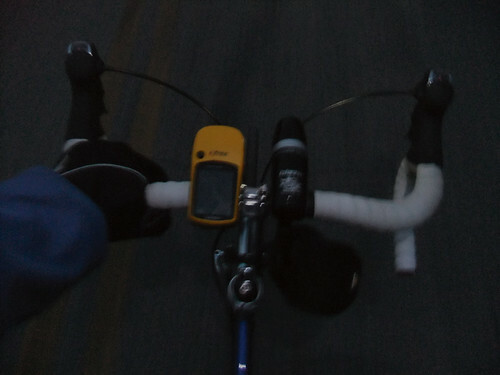 I’ve done a fair amount of night riding, but most of my night rides have been mountain bike rides or commutes. 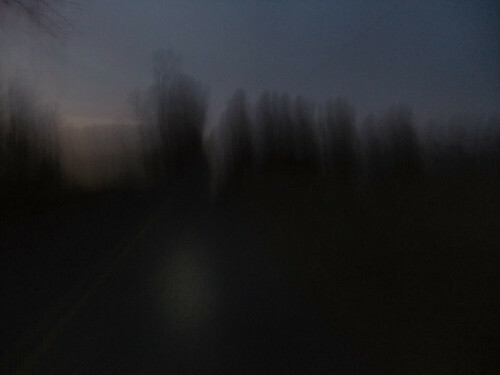 Occasionally I will do a road ride at night, and I usually enjoy it, although I have had a couple of unpleasant experiences with traffic at night. Nothing too dramatic, just some encounters with less-than-patient drivers, but they were enough to make me think twice about taking to the roads at night. 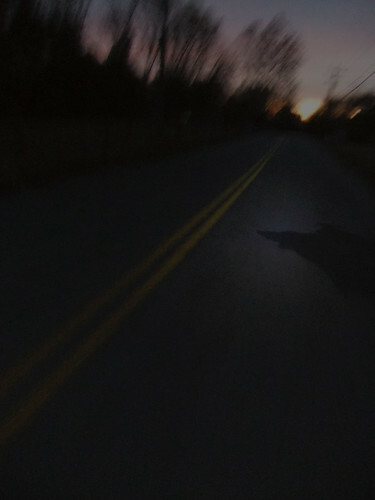 Nonetheless, I’m determined to keep riding as much as possible this winter, and that means riding in the dark. 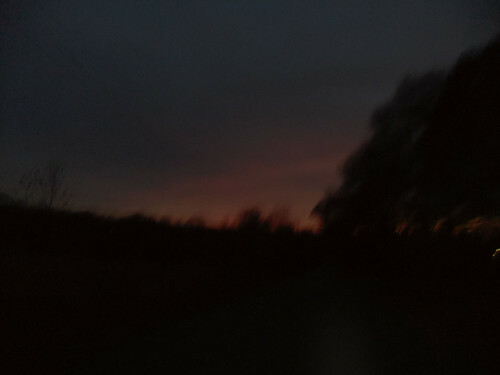 Last night I set out for a ride as the sun was getting low in the sky, and darkness fell over the course of my ride. I had no issues at all on this ride, and it was a wonderful experience. I rode a very familiar route, which helped, since I had a pretty good idea where the pavement was rough, and where to be especially aware of traffic, etc. 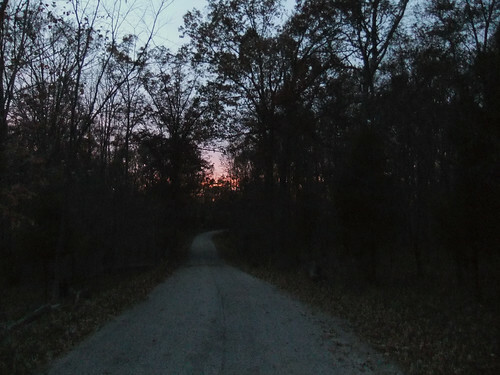 With temps in the 40s, there was a chill in the air, and a general sense of quiet stillness was the theme of the ride. With almost no traffic, I had the roads all to myself. The crisp air held the fragrance of dead leaves, punctuated occasionally by the smell of a fireplace or wood stove. 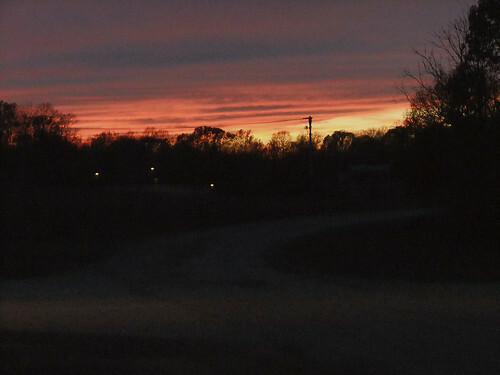 … or, more accurately, several sunsets. A few times, I thought the sun had finally dipped below the horizon, only to climb up on a ridge and see it setting once again. This creepy barn was also quite a sight. Frankly, I’m surprised that the photos so far turned out as well as they did. 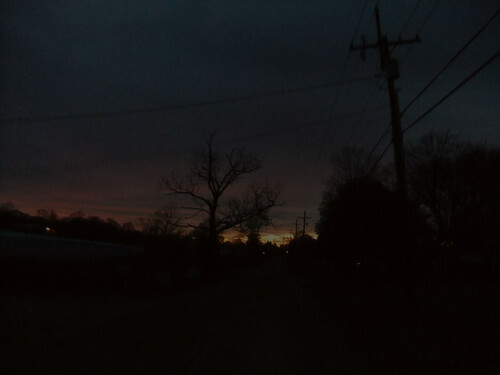 It was getting quite dark. Things get a little more abstract from here. All told, I rode 21 miles, half or so in the dark. And I had a wonderful time.